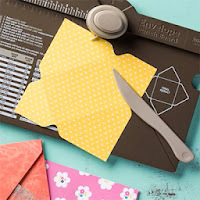 I love the envelope punch board and have spent a lot of time with it making boxes, bows, crackers, tags, shaped cards and yes even envelopes. Even better I've now found on the web a way to line my envelopes. First using the instructions included on the envelope punch board I made an envelope to fit a 10.5x14.8cm card, stopping before I stuck it all together. Next I made a slightly smaller envelope to fit a 10.2x14cm card out of the Modern Medley Designer Series Paper that I'd chosen for my liner. Because not all of the liner is visible I trimmed the smaller envelope as shown in the photo to avoid extra bulk when putting the envelope together. Adhere the liner to the envelope as shown in the photo. Complete your envelope and it looks like this. Click on the photo for more information on the Envelope Punch Board.